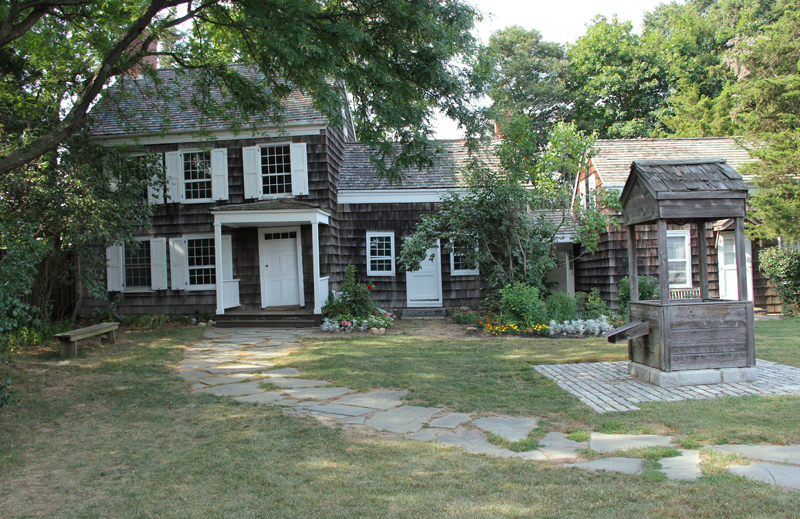 The Whitman family roots on this part of Long Island date back to the early 17th century. Walt Whitman’s ancestors were farmers, served in the militia, and were active members of their community. Some time after Walt’s parents Walter and Louisa had married in 1816, they set up housekeeping in this simple, Federal-style home. They had three children here. Their second son, Walter Jr., who was to establish a great literary career, was born here in 1819. When the Whitman family moved to Brooklyn in 1823, Walter Sr. sold the property to Carlton Jarvis whose descendants retained it throughout the 19th century. After 1899 the house exchanged ownership several times. In 1910, it endured a fire that destroyed a kitchen wing. Recognizing the structure’s vulnerability, the Huntington Historical Society spearheaded local interest in protecting the property. Attracted to its historical associations, John and Georgia Watson purchased the house and lived there for over 30 years. In the 1940s, plans were made to purchase the house and turn it into a historic site. In October 1951, the newly chartered Walt Whitman Birthplace Association acquired the house and grounds. In April 1957, Governor Harriman signed a bill for the state to assume ownership, and on September 28, 1957, it became New York’s 22nd state historic site. With many of the pointed blossom rising delicate, with the perfume strong I love…. In 1957, the New York State Education Department undertook the first efforts to restore and furnish the house to an early 19th century appearance. In 1998, acting on the initiative of WWBA staff, State Parks Bureau of Historic Sites at the Peebles Island Resource Center (PIRC) conducted microscopic paint analysis. It was then discovered that the Prussian Blue color that you see on the trim today reflects the true 19th century color. If you have visited the Birthplace prior to this date, you may notice several significant changes to the building. On the exterior, the rough shakes that once covered the house have been replaced with smooth wooden shingles to create a more historical accurate interpretation. The new shingles were nailed at the bottom edges as were the original. Based on photographs from the late 1890’s, a front porch and shutters have been reconstructed. The 1958 connector between the historic house and the caretaker’s cottage, constructed in 1958, has been removed as well as foundation plantings around the house that dated to the 1950’s. The lilac bushes were retained since photographs from the 1890’s show them in the same location. It is remarkable that the interior of the house retains such a high degree of integrity. In fact, as part of the recent restoration work, a second floor bathroom installed by the Watson family in 1917 was removed to recreate the bedroom that was part of the house’s original floor plan. Aside from this early 20th-century modification, the floor plan has remained largely unaltered. In 1997, staff from Walt Whitman Birthplace Association and the PIRC formed a team to conduct research and made recommendations regarding restoring the historic house and implementing a furnishing scheme that accurately reflected the lifestyle of a rural family of modest means. Walt Whitman’s parents were of humble origin and in the early stages of establishing their household in the 1820’s. Since primary sources related to the Whitmans are scarce, staff turned to census records and probate inventories to determine the appropriate furnishings for the young Whitman family. Curators selected furnishings that reflect Walter and Louisa's economic status. In conducting research, staff noticed that the Long Island inventories of this period generally do not include floor or window coverings, carpets, sofas, settees, or decorative pictures. Therefore, the rooms are simply decorated and simply furnished and include pieces that would have been available to a couple with limited resources. Step back in time to a cold, mid-winter afternoon in February 1821. You will discover that the Whitman household is in a pleasant disarray caused by the birth of baby Mary Elizabeth the previous week. Using the 1820 census, WWBA and PIRC staff were able to determine who was living at the house at that time. Based upon that information, interpretive scenarios were developed for each room in the Whitman house. In February 1821, the most likely inhabitants were: Walter Whitman, age 31; Louisa Whitman, age 25; Jessie Whitman, age 35 months; Walt Whitman, age 21 months; Amy Van Velsor (Louisa’s mother), age 60; Hannah Brush Whitman (Walter’s mother), age 65; neighbor women between the ages of 16 and 25; and two male farmhands or boarders between the ages of 26 and 45. As you tour the Birthplace, you will find the doors off the front hall closed to conserve heat as they often were on cold winter days. The front parlor is neat and tidy in contrast to the rest of the house. Here you will see the family’s best furnishings since this is where guests would have been received. The rear parlor, probably used as a "family room" for sewing, card playing, tea, reading, etc., was transformed temporarily for Louisa when recovering from childbirth. There is evidence of children’s activities underfoot and signs of household tasks that the grandmothers might have performed when not tending to the recuperating new mother. In the other front room, which was used for food preparation, ironing, and dishwashing, you will discover that Walter Sr. has spread out his carpentry tools to take inventory. Here, there are more clues that children are at play and that a meal is being prepared, perhaps by the young woman identified in the census. You will notice that the doors to the second floor bedrooms are closed, again, to conserve heat. The front bedroom has been refurnished to reflect the living quarters of two hired hands noted in the census. The master bedroom is most likely where young Jesse and Walt slept beside their parents. These rooms contain such effects as towels, clothes, and toys. The rear bedroom has been furnished as a space in which Hannah Whitman, Walter’s mother, spun wool on the great wheel. This room may have also served as a bedchamber for the two unidentified women listed in the 1820 census. The garret serves as a storage area for foodstuffs and items the Whitmans have discarded. It was once only accessible by the back stairs. Enjoy your visit to the restored Walt Whitman Birthplace. The story of this historic house provides us with much insight into the poet’s early childhood years, which had a profound influence on his poetry.